One can write from evening till the day dawns but no solution will be close at hand unless a third party sits them down in a round table discussion. This will also not be so clear cut as the rift and the wound have deepened so badly that only an “CARETAKER PRESIDENT” from outside the party might provide sometime for the party to avoid being deregistered. It has happened before in other BN Component parties and even PBDS (now deregistered) was offered but they did not adhere to “outside intervention“. MCA survived the process as they swallowed their pride and accepted the challenge. The whole episode started with the then President George Chan not seeking re-election in 2011. 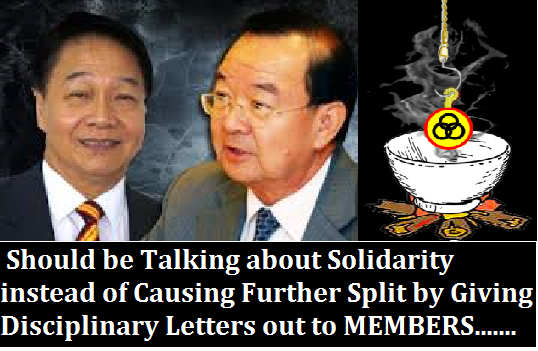 The headlines then was – ( It’s Wong Soon Koh versus Peter Chin Fah Kui for SUPP president post) It reads clearly December 8th-11th 2011 a total of 600 SUPP delegates will be electing their President. Whatever happens after that led to this unhealthy and ugly episode whereby all dirty linens were put out in the open for the people to digest. We have written many articles about this and given also SOLUTIONS but obviously the stubbornness amongst party leaders will not let up. Todays Borneo Posts Headlines “Wong confirms receiving letter from disciplinary panel” will start another round of UNHEALTHY EXCHANGE OF WORDS which will be the ‘death kneel ” for the party if no intervention is forthcoming. WE WANT TO WRITE MORE BUT THE PARTY MEMBERS KNOWS THAT MORE INFIGHTING WILL ONLY MEAN TWO WORDS’……. THE END…….